Zesty Sausage Bundt & A Giveaway! For this week's Rhodes Guest Blog Post, I chose to make the Zesty Sausage Bundt. This was a very easy recipe, but it does requires a little planning. The rolls take about an hour to thaw and you will also need 30-45 minutes for the assembled bundt to rise before baking. This smelled fantasic while it was baking! We couldn't wait to try it. I did make a couple of additions - we added some mozzarella cheese, garlic powder and red pepper flakes to the sausage layer. I also decided to serve this with some warm pizza sauce. The Zesty Sausage Bundt was fabulous!! We both went back for seconds. I highly recommend it!! 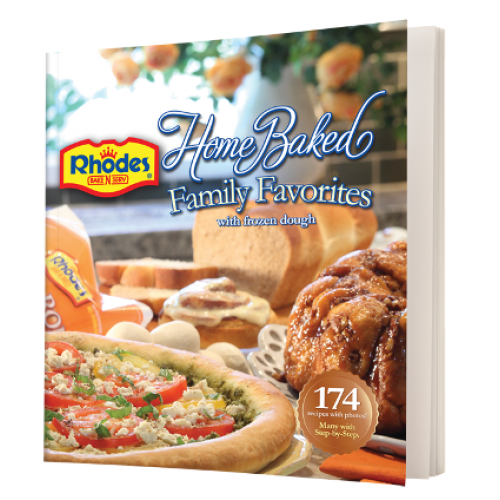 Rhodes has offered to give away a copy of their new cookbook , Home Baked Family Favorites, to one lucky Plain Chicken reader! This book is packed full of amazing recipes. I have several bookmarked to try. Head over to the Rhodes Blog and check out my guest post. Come back here and leave a comment on how you liked the recipe. Easy! Each item you do will get you ONE additional chance to win (for a total of 4 chances), if you ALREADY do any of these things, they count! So make sure to comment for each item! You MUST leave each entry as a separate comment or only one comment will count! Contest ends Friday June 10th. Winner will be chosen randomly, announced Saturday morning, and notified by email (if available). I don't see your post up on the Rhodes blog yet but I will check back to see it later, because I'd love to have it! Your recipe looks delicious!! Thanks for the chance to win, I love cookbooks! I saw your post. The recipe looks great and reminded me of one in my Pampered Chef cookbook using crescent rolls. I found the braided spaghetti bread post. Looks good! I like Rhodes on Facebook. I'm following Rhodes on Twitter. Great recipe you posted!!! I'm just starting to get back into cooking. So looking for recipes for one or to freeze. I liked Rhodes on FB. Thanks for the give away. I found the post on the Braided Spaghetti Brad from April. I printed the recipe back then and is in my "pile" to make. I love spaghetti so can't wait to give this a try. Thanks. This looks like a variation of what is known in this part of the country as a stromboli. It sounds and looks pretty darned good! Recipe looks fabulous! I can't wait to try it! I already like Rhodes on facebook!! Love bread, rhodes, and sausage. Sounds like a winner. I found your blog, recipe looks great and fairly easy. I look forward to trying it. I love Rhodes-they have been my secret weapon at family dinners for years! The Sausage Bundt looks wonderful-I think adding the sauce was a wonderful idea! Your recipe looks awesome (as usual) and I would love that cookbook! The possibilites with Rhodes rolls are endless! Oh my goodness, this looks delicious! I have some Rhodes in the freezer & THIS will be on our menu for next week! Thank you!! I just 'LIKED' Rhodes on Facebook! Thanks for the opportunity to win! I just subscribed to Rhodes on YouTube (oh my, what have I been missing - tons of videos to watch!) Thanks for the opportunity to win! New reader.......First I Saw the sausage pancakes and I thought, "Hmmmmmm, I Like this blog." Then I saw the zest sausage bundt and I was like, PLAIN CHICKEN WHERE HAVE YOU BEEN ALL MY LIFE? !